To encourage your children to become productive members of the household and establish a consistent routine, print out a pre-made or blank chore chart that will allow you to keep track of your child's weekly to do's. These charts are beneficial because they teach children to be responsible for their chores, and they offer the immediate reward of being recognized for a job well done as each chore is checked off. At this age, children are very eager to help around the house. Sticker charts are a great way to reward children after they have completed tasks around the house. Start with simple tasks and after each one is completed reward them with a sticker. Toddlers need instant gratification and rewarding them right away will encourage them to keep working hard and complete all of their tasks. 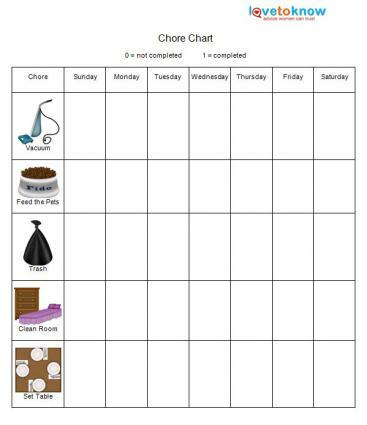 The chart provides specific chores with a picture and description of the chore. If you need help downloading the chart, check out these helpful tips. Preschoolers are still excited to help around the house, and they are old enough to take on a little more responsibility. Chores can now be completed with little supervision and rewards should be motivating and appropriate. Sticker charts can still be used, but they should come with an even bigger reward when all the chores are accomplished. Some great reward options are money, books or small toys. A fun idea is to have a "reward box" and in this box will be a variety of items that they can choose from after their sticker chart is completed for the week. 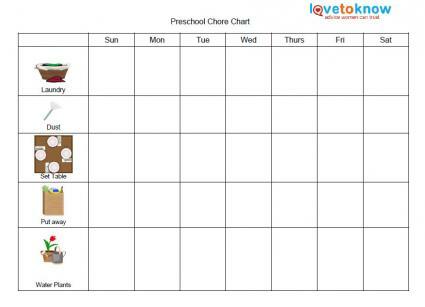 The preschool chore chart has specific chores listed with accompanying pictures and word descriptions. At the elementary age, children can accomplish tasks given with minimal supervision. Children at this stage have a need to be independent, but may not be as willing to participate in helping out around the house, so rewards should be fulfilling. Sticker charts may work for lower elementary age children, but as for the upper elementary age, they may find stickers to be too babyish. The next best thing would be to use a point system where zero means the chore was not completed and one means the chore was completed. Reward bucks are another option at this age. Children can earn fake money after completing a task and cash them in for a reward. The following chore charts allow you to put in the specific chores of your choosing. These blank chart downloads make it easy to customize chore lists so they are just right for your children. Most of these fillable chore charts include a space for listing specific chores, with the days of the week across the top. Keep in mind that for toddler or preschoolers with limited word recognition, you may want to draw a picture (or use clip art or pictures from magazines) to illustrate what chore needs to be done. Blank Princess Chore Chart - This pretty chart features a princess wearing a pink dress and gold crown, with a fun purple and blue border around the chart. It includes space for up to nine weeks of chores. It's ideal for preschoolers and toddlers, though elementary kids who like princesses will like it, too. Blank Princess Chart 2 - This blank princess chore chart has a pink crown with the word 'Princess' in dark pink and a soft pink background with white spaces for the chore. Include up to 16 weeks of chores on this chart. Western Chore Chart - Your little cowboy or cowgirl will like this Western-inspired chore chart that has a pale brown and tan background of a Western shirt and is finished with a bold Western belt buckle and jeans design. Edged in plaid and done with green lettering, this chore chart allows space for up to 15 weeks of chores. Blank Cat Chore Chart - If your child likes cats, this chart will be fun and motivating. It includes a cute grey cat in the corner, a clean white background and a bright blue and green border. Find space for up to nine weeks of chores. 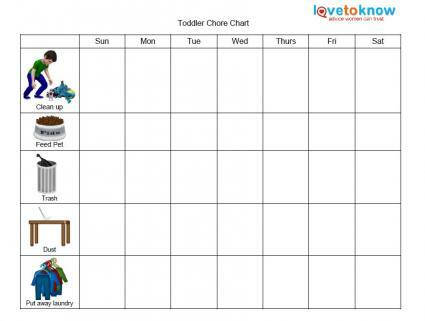 Basic Blank Chore Chart for Kids - This chore chart has a space to put the child's name, so he or she can feel a sense of ownership and responsibility for his or her chores. This design has a simple light blue border, but there's also some space at the top and sides you could include a small picture of your child, or allow him or her to color or decorate it so it's more personalized. Baseball Chart for Chore and Responsibilities - Boys and girls alike often love baseball, so consider this chart to help your little one remember daily chores and responsibilities. Along with daily tasks for self and room, there is a blank section to fill in with other chores and days of the week of your choosing. Dog Chore Chart - What kid doesn't love a cute dog? This chore chart has a cute Dalmatian in the upper corner, dog bones below and a grey textured-looking dotted background with space for up to 10 weeks of chores. Rainbow Horse Chart - A kid that loves horses will fall for this chart, which has images of three white horses with colorful manes and tails against a pastel pink background. There is the option for up to 16 weeks of chores with this chart. The chores your kids will need to help out with will depend on your specific circumstances, and blank charts let you easily tailor them to your family. Maybe you live an area with cold winters; helping to shovel snow off the driveway or entryway may be something you add to an elementary-schoolers chore list during the winter months. Or, maybe you leave early in the morning and you'd like to include helping to pack snacks or lunches the day before to your kid's chore list. If you have a big yard, helping with yard work is something you may want to add - and you can tailor it to the ages of your kids so the chores are appropriate for their level. Mark the amount of the allowance on the chore chart template (either per chore, per week or when the chart is complete, for example) so the child remembers the goal he or she is working towards. Get a fun notebook in a color that matches the chore chart, and use it to help your child keep track of how much money he or she earns each week. Younger kids might enjoy a decorated jar or piggy bank that they can keep their allowance in. Put a label on the front with the amount the child can earn per chore, per week, etc. Have a special place where your child can turn in their chore chart each week. If they've completed their chores, you return it with a sticker and an envelope with their allowance. If you prefer to have your child do chores to learn and not for an allowance, consider adding a section to the chore chart with 'bonus chores' the child can do to earn money once his regular chores are complete. You can also decide whether or not to give a partial allowance for the number of chores completed each week, or if the child can make up chores on the weekend - make notes at the bottom of the page or in the margins with your personalization for these aspects. Use a picture chart for non-readers. To help your non-reading kids recognize common words, use a combination picture/word chart. Get your kids involved in making the chart by letting them color it. Find a theme that will appeal to your kids. Get the whole family involved and make mutual goals by using a printable family chore list. 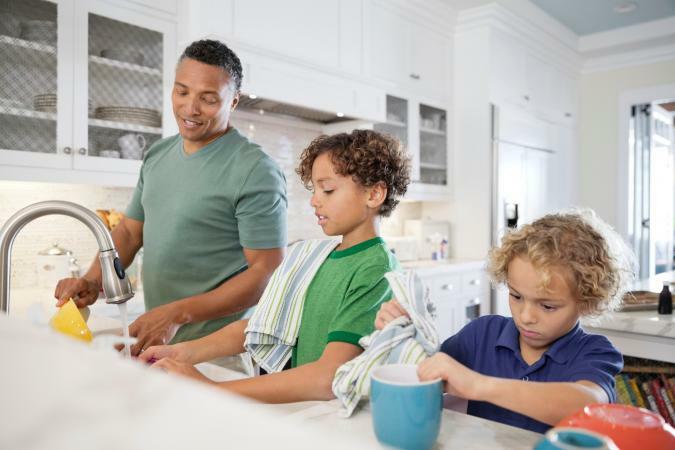 You can mark things that all family members must be responsible for, like making their own beds, and alternate other household chores so kids don't get tired of doing the same ones each week. Give them a goal to work towards. Let them earn rewards, such as television or computer time or a special treat. Reward charts can also be used to either reward kids with a monetary allowance or other prizes or rewards for completing household tasks. 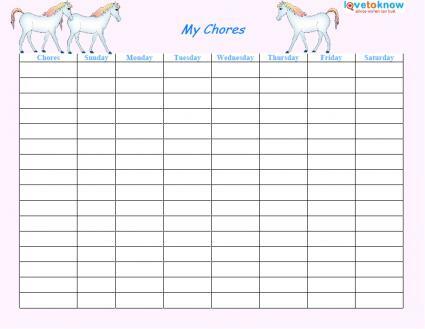 You can also make chore charts special - like decorating the chart with photos of your children doing chores. The chore charts you use must work for your unique needs. If your kids need to have the same chores every day for a week, don't feel you must use a daily chart. Make the chart work for your family; don't try to force your family to change to suit a chart.